The new cables are longer, and rather than providing three short leads that split off for stereo audio and video like the old iPod AV Cable (below, right side), the new cables split in three directions: USB, video, and stereo audio jacks (below, left side). This is an improvement in that it allows the cable to be used in applications where the video jack isn't right next to the audio jacks, such as would be the case if you wanted to plug the video directly into the TV but route the audio into a stereo receiver more than a few inches away. This design also results in a longer and more complex cable. The component version of the new cable kit is identical apart from having three video plugs rather than just the one on the composite cable pictured below. Each package includes the audio/video cable with an integrated USB connector (above) and a wall adapter for powering the connected device while using it for video output. This is useful because playing video requires enough processing power to drain the battery rapidly. Because the cable plugs into the Dock Connector, it is essential to build USB into the cable because otherwise there'd be no way to charge it while using it for video; the old headphone cable could optionally be used alongside a USB to Dock Connector cable for power. Both packages are identically priced at $49.00, which is higher than the old headphone-style cable by itself, but seems reasonable given that it includes a power adapter and is a more complex cable. Apple sells an additional package including a remote and dock, also priced at $49. For users who want video output but don't need a dock, this new packaging offers more flexibility than the old package. In comparison, Microsoft's Zune Home AV kit bundles a remote control and a dock with a USB and video cable and costs $99, just like Apple's old kit. The Zune models do not support higher quality component video output, and the cable kit only works with Microsoft's hard drive players. The flash RAM based Zune 4 and Zune 8 (comparable to the iPod Nano) lack any video output features at all, as noted in the in depth comparison Winter 2007 Buyers Guide: Microsoft Zune 8 vs iPod Nano. 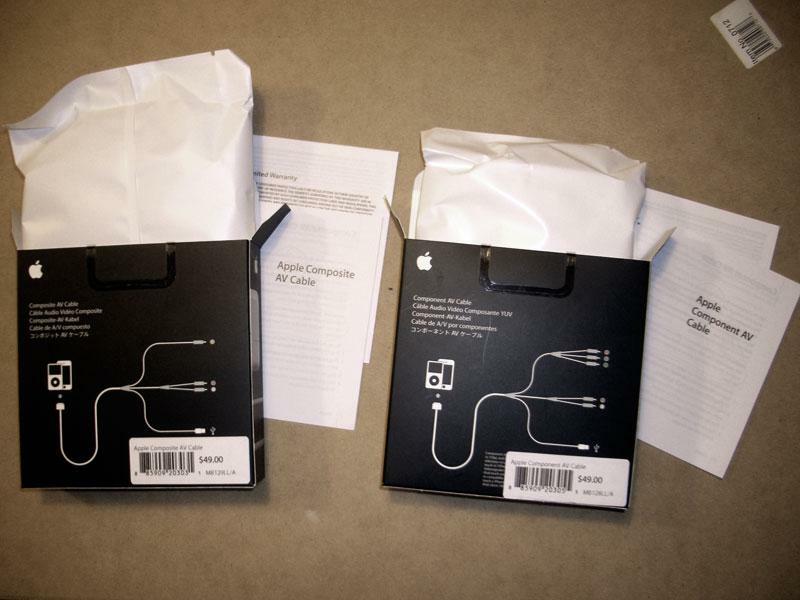 The cable and wall adapter are bundled into hermetically sealed white pouches (below top). The only difference between the two kits is the extraction of different sets of signals from the Dock Connector (below bottom), a difference detailed below. 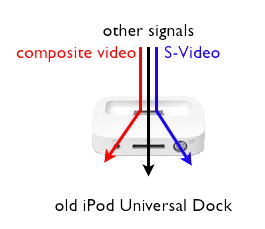 Only the iPhone and Fall 2007 iPods support the new component video. However, the simpler composite version of the cable will also work with both the new iPods and iPhone as well as all earlier iPods with support for video output. 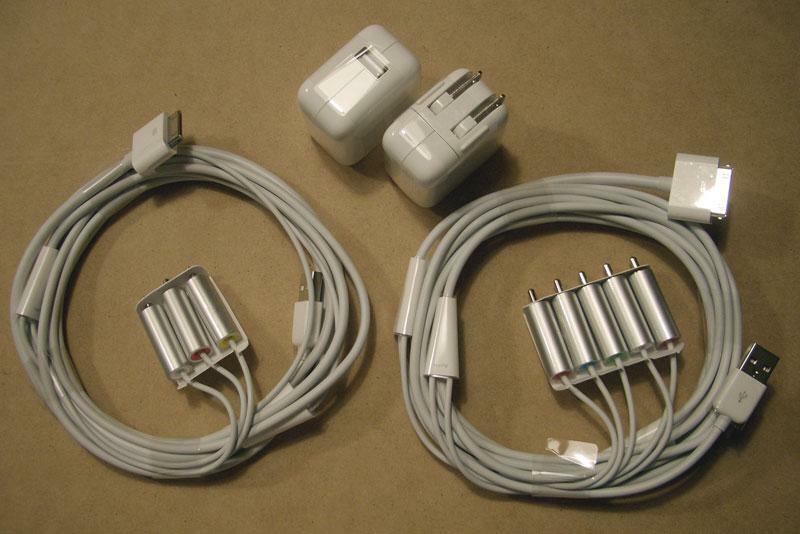 In addition to using the included wall adapter, the cables can also draw power from a computer USB port, and also function as normal USB sync cables. The cables themselves have a couple of irritating qualities. Like the previous iPod AV Cable, the RCA connectors are strangely long, and only color coded on the back side of the jack. This makes it harder to match up cables to ports hidden on the back of a TV, particularly if things back there are cramped and poorly lit, as is often the case. The new cables also seem thin near the video connectors, especially since the RCA jack has a funneled recession where the wire enters. This feels like a weak link. While I didn't have any problems plugging cables in or yanking the wire out of the connector, a more standard looking reinforced, ruggedized connector would seem to make more sense than the fancy but impractical looking jacks Apple chose to use on this utilitarian cable. After Apple introduced the video output changes on new iPods this year, but before it delivered the actual cables, there was a spark of a protest over the use of "authentication chips" to regulate which video output accessories the latest iPods would work with. In reality, those fears of "cable lock down" were invented by conjecture and were simply wrong: there is no controlling chip to worry about. As it turns out, the simplest conspiracy theory is not always the most accurate. The original two generations of iPods —starting in 2001 —used a FireWire connector for both charging and syncing, and a standard headphone jack for audio output. In 2003, Apple introduced the third generation iPods with a new "Dock Connector," a 30-pin plug built by JAE that supplied all the pins of a Firewire port, a USB port, and stereo audio input and outputs in one package. It also has pins that supply output power to an accessory, a sense line to identify the accessory that's plugged in, and serial port pins that enable simple devices to provide remote control and display features, such as showing the currently playing track and remotely navigate songs. These features are used in car integration kits and some other devices that interact with the iPods. The Dock Connector enabled the 3G iPods to work with either type of data cable, which was handy because most PCs lacked FireWire ports, but did have USB. Modern iPods only use FireWire to charge the battery; they lack the electronics to perform a data sync over FireWire, a cost saving measure that seems like a reasonable tradeoff now that all recent Macs have USB 2.0. Apple also left some empty unused pins open, reserved for future uses on new models. When the iPod Photo arrived in 2004 as a high-end version of the 4G "clickwheel" iPod, it featured the first color display on an iPod and new photo features. Additionally, it could also play photo slideshows out to a TV using some previously reserved pins on the Dock connector, or using the iPod AV Cable plugged into the headphone jack. The original iPod AV Cable plugged into the iPod Photo's headphone port, but rather than using just three conductors like a typical headphone jack (right, left audio and ground) it used a fourth to provide composite video output. The other end of the cable plugged into a TV using three standard RCA cables: right and left stereo audio and a composite video connector. 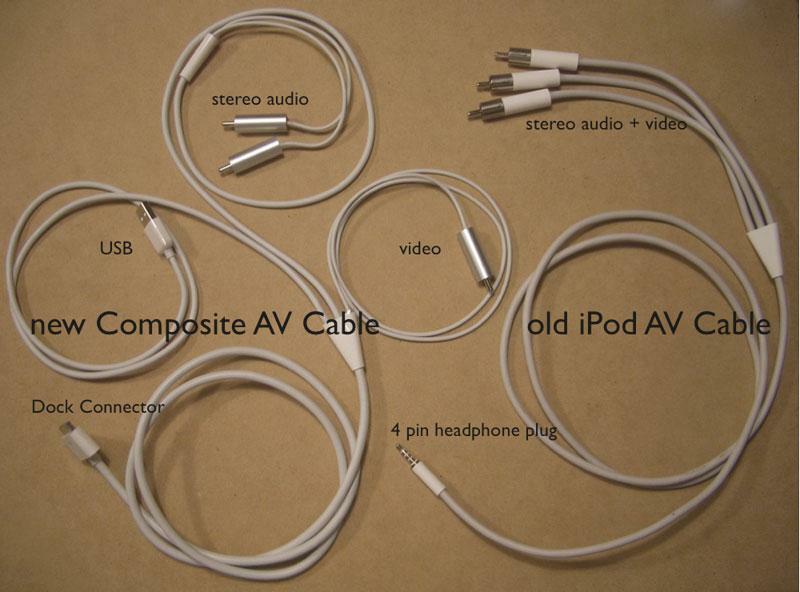 This made the iPod AV Cable similar to many camcorder cables, which also package audio and video into a small headphone jack using four conductors. However, Apple's iPod headphone jacks had to remain compatible with standard headphones, so Apple reversed the odd pin order used by camcorder makers to deliver a headphone jack that worked fine with regular headphones, but could also deliver video output when used with the iPod AV Cable. Camcorder cables could be used by simply reversing the order that the RCA connector ends are plugged into on the TV side. This "change" resulted in some minor rumblings about how Apple was trying to put camcorder cables out of business or lock users into its own $20 cable, but were minor in comparison to the latest dustup over Dock Connector cables. two pin composite video, which mixes video signals together on one signal pin and uses one ground pin. four pin S-Video, which offers higher quality video output because it delivers the TV video signal over two independent channels: luminance (a full resolution monochrome signal), chrominance (additional color information) and two grounds (one for each signal).